Glass. We do everything with it. We drink from it and we make all kinds of things of it, such as bottles, decanters, beakers, bowls, vases, jars, spectacles, beads, dishes, cabinet doors, car and other window panes, and - last but not least - art. Glass consists primarily of silicon dioxide or silica, a chemical compound, but which has no crystal structure. Still, like many crystals, it has the properties of being transparent and refracting light. A well-known type of glass for everyday use and for decorative objects is lead glass, in short crystal glass or crystal. Glass, which has come to have an important functional and decorative role in our daily life, is made by mixing sand, lime and soda in the right proportions and then heating this in an oven. These ingredients then coalesce into a tough, pliable mass and when it is cooled down, leaves a hard material with a smooth, shiny surface. Glassblowing is an art in its own right. It is a technique that involves inflating molten glass into a bubble (or parison) with the aid of a long, steel blowpipe and then shaping it while at the same time turning it. The blowpipe has to be long, because at one end it is extremely hot, and yet it needs to be cool at the end, where the craftsman blows. Glassblowing is a rather difficult technique and requires a lot of patience and talent. The blowpipe is hollow and has a mouthpiece and a steel conical head, with which molten glass is taken out of the oven for blowing into a mold or for making an object by hand. "I was five when I first saw the glassblowers of Murano. I couldn't believe my eyes." The Italian master glassblower Gerardo Cardinale, who has run his very popular business in the idyllic village of Vaals in the south of the Netherlands for over 30 years, is one of the greatest glass artists and was awarded the title 'European Glass Master' in 1995.In his showroom next to his glassworks, you can admire numerous artistic shapes and objects in glass, even paintings interwoven with glass. The Italian is a much admired artist who attracts 10,000 tourists a year to his glassworks and is always happy to show people around both his workshop and the adjacent shop. As Cardinale explains: "As a little boy I lived near Naples and quickly came into contact with glassblowing. I first admired the glassblowers of Murano when I was about five years old. I coudln't believe my eyes. I thought, this is a joke. But, fascinated, I kept on looking at those glassblowers and watching them doing spectacular things with glass and crystal. Then I thought to myself, when I grow up, I want to be a glassblower." 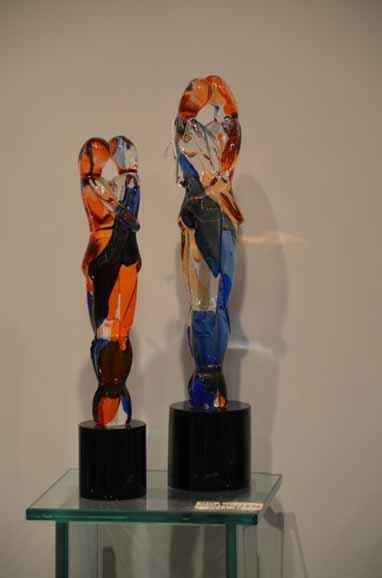 "Murano: The centre of European glass art." Murano, which is famous for its wonderful glass art, mirrors and candlesticks, is about one and a half kilometres north of Venice and, just like Venice, it is a collection of islands connected to each other by bridges. The island also houses the Museum of Glass Art (il Museo di Vetrario, founded around 1860) and the Academy for Glassblowers (the Scuola di Disegno per vetrai, which was superseded in 2001 by the Scuola del Vetro 'Abate Zanetti'). Here glassblowers and glass artists can follow one or two year courses or even short, intensive courses." The famous glass of Murano is made in the traditional island way. It is believed that the origins of glassmaking in Murano lie in the 8th century Rome when Venice was a major trading port with significant Asian and Muslim influences. Murano's reputation as as centre for glassmaking was born when the Venetian Republic, fearing fire and the destruction of the city's mostly wooden buildings, ordered glassmakers to move their foundries to Murano in 1291. In the small alleys of Venice, the glass furnaces regularly caused fires and problems witrh smoke. It has also been said that people wanted to bettersafeguard secrets of glassblowing by making the glassblowers move to Murano. Murano's glassmakers gheld a monopoly on quality glassmaking for centuries,developing or refining many technologies including crystalline glass, enamelled glass (smalto), glass with threads of gold (aventurine), multicoloured glass (millefiori), milk glass ((lattimo) and imitation gemstones made of glass. Gradually, Murano became the centre of European glass art and, at the beginning of the 21st century, glass is still the most important industry on Murano. 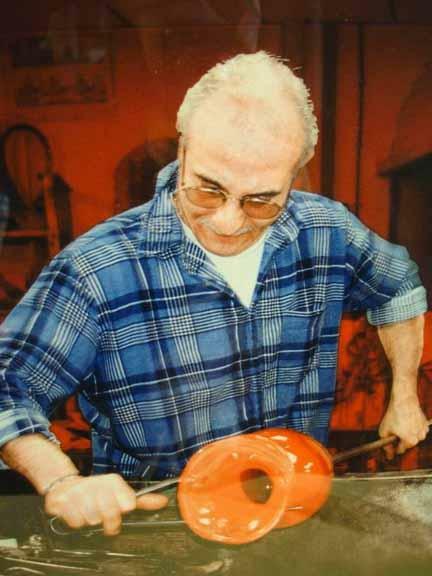 With a smile the Italian master glassblower Gerardo Cardinale describes how glass actually developed. "Although no precise dates are known, it has been said that Roman soldiers, who were transporting stones, accidentally discovered glass in the region of Syria, around 3,500 BC. After they arrived on a beach, they pitched camp and made a fire to prepare a meal. The saucepan was standing on hot nitrate blocks and, because of the intense heat of the fire, the nitrate blocks fused with the sand of the beach which also contained lime and soda and shells. When it had cooled down, a glass-like substance had formed." Around 5,000 BC, the inhabitants of Mesopotamia are also supposed to have made beads of glass and around 1,500 BC the first perfume bottles were made. It was the Egyptians who later further refined the technique and exported glass to countries far beyond their boundaries. Subsequently the Phoenicians and the Greekmade new discoveries in this field. In the Hellenistic period (at the height of the Ancient Greece and the conquests of Alexander the Great (356 BC), glass was shaped by being pressed which enabled large drinking cups to be made. But it was the Roman Empire that made the biggest discovery regarding glass art - the blowpipe, which made it possible to create glass objects in a wide variety in forms." 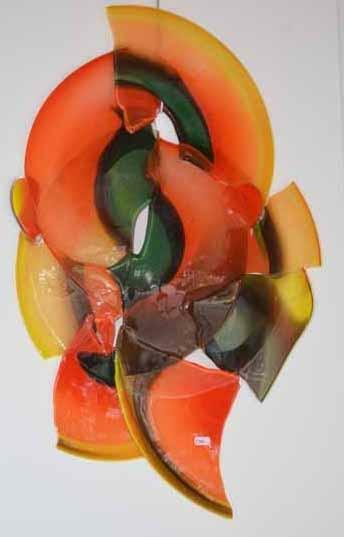 Gerardo Cardinale has been working with glass for many years. At the age of 16, he left his hometown of Avellino, near Naples, to go and study in Venice, where he learned the trade of the famous glass master Lino Tagliapietra. He has nolw been active in his own glassworks in the idyllic village of Vaals, in the south of the Netherlands, for 38 years. Here he has built up a strong reputation and a large clientele, working bolth for private customers and companies, and making all sorts of artistic objects, such as the light-based art work (see the photo on the left-hand side). Gerardo Cardinale: "I came to the Netherlands with my parents to live and work in 1980. Before that, we lived in Germany for about 10 years, from when I was 12 until about 22. There I also worked in a glassworks. From the age of 16 until 26, I studied with Lino Tagliapietra in Venice, travelling each time from Germany to Italy. I come from an artistic family, some of my brothers and brothers-in-law have worked in glassblowing, but I am the only one who learnt the trade in Italy." 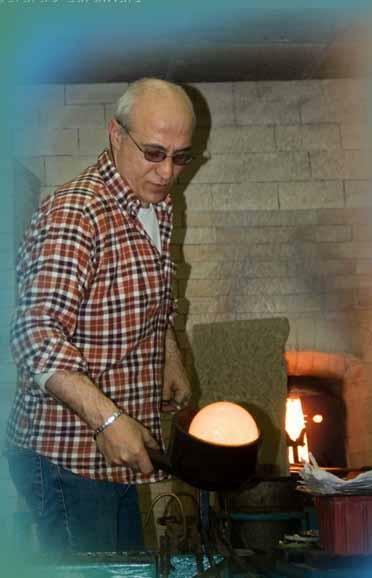 "In glassblowing timing is one of the most crucial factors." "When studying at Tagliapietra, for the first 3 years I just learnt the basic techniques. 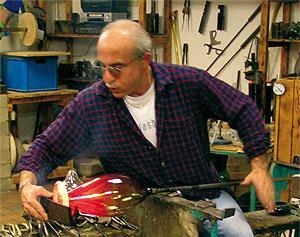 Many people think that glassblowing is easy and just consists of blowig. But it is actually more the timing which is important, the right 'feel' of the heat, and the turning of the glass. First you need to properly master the basic techniques. You have to be able to play with glass. Then, after that first period, you learn how to play and model the material yourself. That is the old craft, the way people used to do it. Then, without a mold, youi have to be able to make certain designs. You need a certain time to be able to do that. Yo9u cannot work without any limitations on a piece, there is a fixed time within which you must be able to do that. And the it must also be good! It goes extraordinarily fast and the anatomy of the piece must also be right. For example, if you make a horse, the proportions must be exactly right. When practising the old skills you can make your own compositions. You also have to be able to improvise and you get plenty of opportunity to do that." "I work with an oven that weighs 500 kilo and heats up to temperatures of 1100 and 1200 degrees, and with a melting point between 1300 and 1400 degrees. The temperature has to be adjusted just right, and since yopu work in a very hot environment, you have to be dressed to be able to stand that. The whole process is very artistic. Everything must be right from the beginning, the proportions, the cooling down, in facxt the whole procedure before you can start. My teacher, Lino Tagliapietra, mastered every detail. Artistically hje has taught me a lot. This yeart we have started taining youngsters in my glassworks in Vaals. We will try and work together with schools and invite schoolboys and schoolgirls to come and gain some working experience. We work a lot for private customers, but we works also with architects on interiors for large-scale companies, also on an international level. 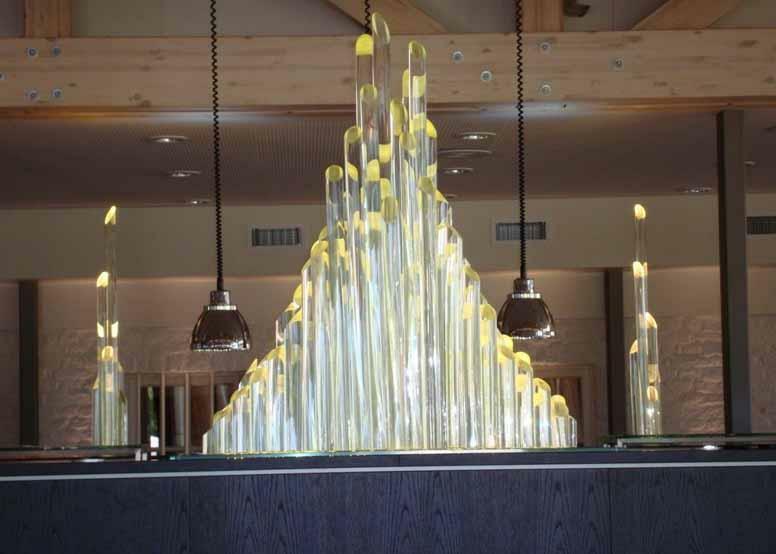 We even equip hotels and, two years ago in America, we made a chandelier which the client installed on a yachts. For me that was an historic moment." "An indescribable passion for the profession"
Gerardo Cardinale sums up his passion for his art. "The most fulfilling thing is when you can make a beautiful piece of art out of a bulb of crystal. When that is finished, it gives you a great deal of satisfaction every time you see it. A vase, a swan, a dish or a rearing horse, every time you make something, you try to create different effects and a range of colours. That is the real craftsmanship and you only learn that throlugh a lot of experience. 5 per cent of the clear waste is recycled. The beauty of the profession is indescribable. I still find it fantastic that I am allowed to create these kind of products for my customers. And the fact hat people like them so much gives me a lot of satisfaction. But is goes without saying that you need to have o lot of discipline and you must be able to bear the heat. The warmth near the oven is around 60 degrees. You must endure it, even in hot weather. It is not always fun, but I practise the art of glassblowing with love. The worst thing for me would be that I was unable to practice my profession anymore." In the shop next to his glassworks you can buy a wide range of objects and art by Gerardo Cardinale himself, but also items from other well-known brands. There is also a museum where you can admire the many ancient glass objects and art that are on display inside.